Stay tuned to the very end for a special easter egg surprise (silliness ensues)! Hello, Through the Eyes of a Therapist Podcast listeners! If you’ve gotten this far in my latest series on becoming a therapist, you’ve heard about Licensed Marriage and Family Therapists, Clinical Social Workers, and School Counselors. You know by now that to become a therapist, you need to get a master’s degree and to become fully licensed, you must complete a post-graduate internship. Most of these last at least 18 months post masters and you need to accumulate 3,000 hours of supervised practice. Supervised practice means that you must contract someone who is a clinical supervisor to oversee and sign off on your 3,000 hours. Clinical supervisors make an investment in provisionally licensed practitioners by meeting with them on a weekly basis, going over treatment plans, evaluations, personal issues that may be affecting work with clients, and progress notes. This is, probably, the last time a clinician is being closely monitored in their career before becoming independently licensed. Social work is a diverse and large field where individuals can grow professionally in many different directions. Clinical Social Work is one area of specialty where social workers can conduct therapy services. Licensed Clinical Social workers are trained in a variety of therapeutic modalities that allows them the title of "therapist". LCSWs, LMFTs, LPCs, Counseling Psychologists, and some school psychologists can do "therapy" or what we call "clinical work". After this episode about LCSWs, I will be interviewing psychologists and therapy/clinical supervisors so you can understand the nuanced positions the mental health field has to offer. Erica Barrales, LCSW is a Licensed Clinical Social Worker, who currently works as a Senior Social Worker for Orange County Children and Family Services in Orange, California. She currently is assigned as a Senior Social Worker in the Specialized Family Services: Continuing and Court Officers program. For the past 11 years, she has worked with children and families in the capacity of family reunification, family maintenance, and adoption focused cases. For the past 5 years she has worked with the special medical, developmental, and behaviorally fragile children and families. She is a seasoned and well-rounded leader within her program. She’s been in the social work field since 2003 and has experience in school counseling, psychotherapy, and supervising Associate Clinical Social Work interns. She provides clinical supervision to Associate Clinical Social Workers earning clinical hours for licensure. She was raised as a daughter of Mexican immigrant parents, and grew up in Anaheim, CA. She is married to her husband of 13 years, who is a deputy sheriff. She has 3 boys, ranging from 4 to 12 years old, loves to drink wine, dance, and spend time with her large family. Alvely Alcantara is an LCSW in the state of NC with cultural roots in the Dominican Republic. She has been in practice since March 2015 at a nonprofit serving the local Latinx community. The majority of her work is done in Spanish as most of her clients are Spanish speakers. She specialize in trauma treatment, depression, anxiety and adjustment/acculturation problems, and primarily works with females. She loves working with teens (15+) to young adults but has the ability to work with people from eight to a geriatric age. She is not yet in private practice but plans to take that next step for her career. She has a passion for working with the Military population and comes from a military family herself. REMEMBER TO FOLLOW TTEOAT PODCAST ON INSTAGRAM, TWITTER, AND FACEBOOK. Social Workers can thrive in many settings---hospitals, mental health clinics, schools, and much more! Elisa and I discuss the versatility of social workers and talk about what it takes to become a clinical social worker. Elisa Dobler, LMSW is a therapist at the El Paso Child Guidance Center since October of 2015. Elisa has a Master of Arts from Bowling Green State University and a Master of Science in Social Work from UTEP and is Licensed Clinical Social Work Candidate. While in the master of social work program, Elisa was awarded the Hogg Bilingual Scholarship for Mental Health and the SAMSHA/HRSA Borderland Child and Adolescent Behavioral Health Initiative Grant. Currently she is trained in TF-CBT, EMDR among other modalities and works primarily with victims of crime. Previously, Elisa worked in public education as an IB (International Baccalaureate) teacher and English IV teacher from 2006-2013. She speaks three languages and enjoys taking weekend hikes, playing the piano, and spending time with family. In this second part of HOW MARRIAGE AND FAMILY THERAPISTS ARE MADE, we are moving up the ladder. In this episode, I speak with two fully licensed marriage and family therapists. They spill the tea on how to sustain yourself as a therapist, how therapy is "soul work", and the importance of Latinxs becoming therapists! Below is must-have information on my guests! Maritza received a B.A. in Criminology and a B.A. in English from University of California Irvine where she interned for the OC Public Defender's Office interviewing minors in custody at Juvenile Hall. Upon graduating she was hired as a Victim Advocate assigned to assist victims in domestic violence cases going through the criminal justice system. She decided to pursue her Master's degree in Marriage and Family Therapy at the California School of Professional Psychology after witnessing the effects of unhealthy relationships and the dysfunction these create for everyone involved; from the children who felt lonely and misunderstood in their own homes, to the adults dealing with the mental and emotional impact resulting from their unhealthy relationships. Throughout her career, Maritza has worked with individuals, couples and families addressing anxiety, depression, grief, post-traumatic stress disorder (PTSD), childhood trauma, domestic violence, sexual assault and relationship issues, to mention a few. Her style is to use an integrative, client-centered and emotionally focused approach that includes mind-body techniques and provides clients with practical tools. She is also trained in Eye Movement Desensitization & Reprocessing (EMDR) therapy which she finds helpful in working with individuals trying to address past traumas and Emotionally Focused Therapy (EFT) which she uses in her work with most couples. 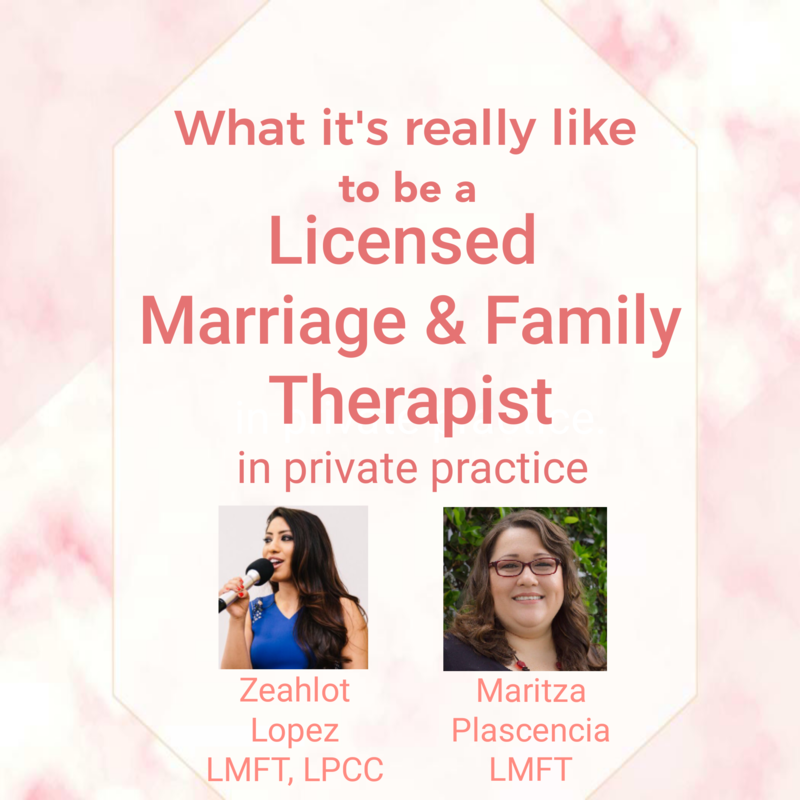 Zeahlot Lopez is a Licensed Marriage and Family Therapist and Licensed Cosmetologist helping humans rebuild their spirit. Guided by her intuition, clinical training, life experiences, and some luck she currently helps individuals and families lead a happier life! Aside from providing mental health services to better the lives of her clients, she enjoys providing coaching services to entrepreneurs and those looking to increase their emotional intelligence. She enjoys comedy, singing in her shower, and cooking new dishes. Recently she was featured on the television network Univision, speaking on challenges associated with Mental Health and in LA Voyage magazine as a featured entrepreneur. She is currently creating workshops for women and young professionals.